The Panther T5 provides a unique solution to steer a kicker motor. Can be installed on kicker motor with threaded tilt tube without drilling any holes in the boat. 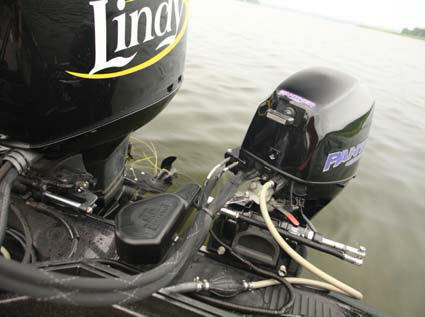 Installs in minutes and requires only 4 inches between main engine and kicker. Mounting hardware included. Motor is encased in black delrin, water resistant, mounts thru-the-tube. Controlled by a 2 button hand held remote with 24' cable. This product EXCLUDES the electronics that would be duplicated with a Trollmaster Pro 3.